The Right Bank’s where it’s at when it comes to partying in Paris these days. Nikola Sarbinowski drinks her way through the old and new of Belleville and beyond. There’s little in Belleville to hint that this northeastern neighbourhood was once a wine-growing village that lured Parisians beyond the city’s walls. Today, maneki neko lucky cats beckon from windows in Chinatown, shishas sweeten the air, art studios abound and cool twenty-somethings cram into cafe patios, drinking Stella and chain smoking. But trace Belleville’s roots beyond the shuffle of gentrification, past its days as a seedy ’burb and you’ll discover it has long been a place to party. Before Paris swelled and, in 1860, swallowed the popular weekend retreat, the town was praised for its produce and loved most of all for the hundreds of taverns, goguettes (singing clubs) and cabarets that sold cheap wine and good times – two ingredients you’ll still uncover today. Make this your home base and explore the surrounding neighbourhoods that have usurped the Rive Gauche’s (Left Bank’s) claim over the city’s creative types. With inexpensive Vélib’ bike stations every 300 metres, it’s best to set off on two wheels, then switch to foot and métro when booze dances through your blood. The French start drinking early, so you should too. But that doesn’t have to mean popping a cork. Despite the nation’s love affair with wine, the landscape is shifting, and Paname Brewing Company (PBC) is one of the new kids crafting beer. Hovering over the Bassin de la Villette, a 10-minute bike ride from Belleville, PBC opened its doors in an old granary in June 2015. “It’s like Brooklyn 10 to 15 years ago,” says manager Fred DeBelge of the area, once a bustling port. As one of just 10 or so breweries in Paris, PBC is hoping to break down what DeBelge regards as an impenetrable “beer geek” culture. It seems to be working – there’s usually six brews on the go, the brewery produces 2000 litres of beer a week and seats start filling in the early afternoon. Slurp a pint of Barge du Canal, an American-style IPA, and run your eyes over the shiny vats or the blackboard detailing the preparation of malt. If you’d prefer to sit in the sunshine, choose a spot on the pontoon next to the 150-year-old cherry tree and watch little boats go by. That the term jus de chausette (sock juice) is part of the French vernacular for coffee is rather telling of the quality of the stuff. Uncovering an espresso that wasn’t burnt to bitterness was, up until five years ago, like finding a gluten-free baguette. Now, dozens of cafes serve single origin brews. At the helm is Belleville Brûlerie, a roastery whose shopfront is only open for six hours on Saturdays. 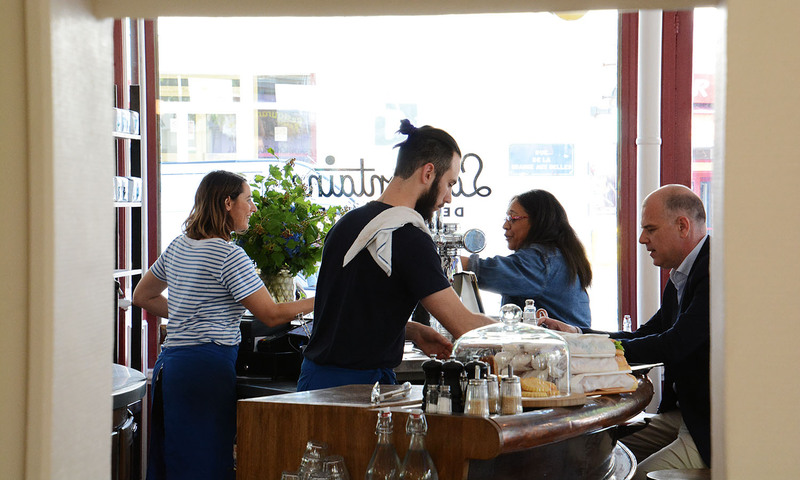 The good news is it supplies many of the city’s best cafes, including La Fontaine de Belleville. Just a short walk away from PBC, it’s open later than most, so you can perk up from your pale ale-induced haze. Here you’ll find the best parts of Paris’s famous cafe culture with the added bonus of excellent coffee. Sit among patterned tiles and round tables and watch Belleville dwellers pass by. Don’t be surprised if a hundred-strong troupe of rollerbladers scoots around the corner, only to disappear before you’ve had time to whip out your phone. Not a drop of sock juice in sight at La Fontaine de Belleville. Trade vessels and houseboats trundle along the man-made waterway of Canal St Martin. Just before it dips underground to emerge again at Bastille, its banks are flanked with massive plane trees offering shade from the sun in summer. Wander along, crossing over the iron footbridges and ducking into the boutiques that line the streets on either side. On a warm evening, join the droves dangling their legs over the concrete edge and imbibing bottles of 1664 and inexpensive supermarket vino. In a country so famous for food, restaurants need to pack a punch to stand out. Stroll from Canal St Martin back towards Belleville and you’ll hit a favourite, Le Chateaubriand. Ten years ago the restaurant lit a fire under the stuffy food scene by making fine dining accessible. Basque-born chef Iñaki Aizpitarte creates a new eight-course tasting menu each day, often marrying typical French dishes such as foie gras with ingredients like miso soup. The experience will set you back €70 but it’s worth every euro. Reservations for the 7pm seating open three weeks in advance, and if you miss out on one of these you can take your chances lining for the second slot. French gardens are usually orderly, with manicured shrubs, gravel paths and metal chairs, but Parc de Belleville has a haphazard mix of plants, a vegetable patch and, as a nod to the region’s wine-growing past, 140 grapevines. Come here around twilight, before a park officer drives picnickers out of the grounds with the help of a whistle, in a ritual that takes place every night in parks across Paris. Up the hill, just above the greenery, the Belvédère de Belleville terrace looks out over the City of Light. 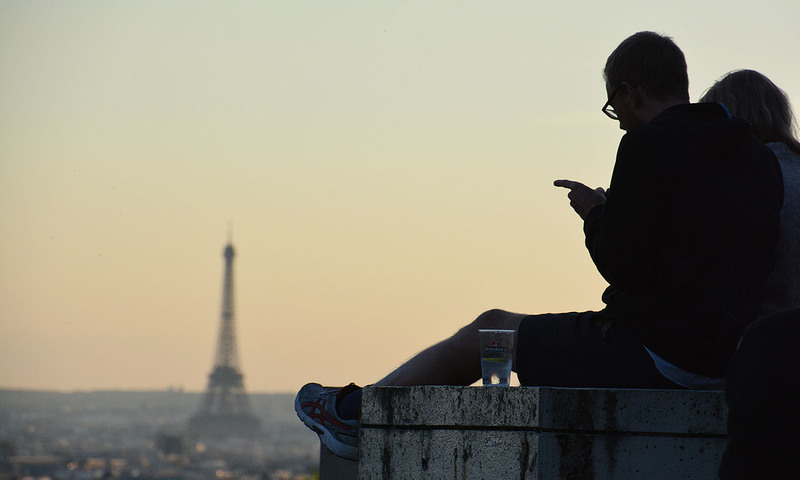 An excellent place to watch the sunset, it’s where locals go, often with guitar in hand, to spy the Eiffel Tower without the risk of losing their nonchalant facade in front of tourists. If you’ve been walking the avenues between tall, almost identical buildings, this helps to reset your sense of perspective. Scan the terracotta chimneys popping up like periscopes from every roof and spot Notre Dame and the stone skeleton of Saint-Sulpice in the distance. In the last of the golden light, wet your lips on the terrace of Moncoeur Belleville. Sunset calls for a coupe de champagne, don’t you think? I spy the Iron Lady. What do you get when a pharmacist, gallery owner and sound engineer walk into a bar? La Cave de Belleville. Keeping up with the creep of gentrification through the area, they transformed a former leather supply store into a wine bar that sits among kebab shops, boulangeries and cheap Asian takeaway joints. An impressive library of French and international wines covers one wall, complete with a ladder to help you reach drops perched up high. Fromage in various stages of mould fills the cabinet near the front, and saucisson and olives make an appearance too, ready to be dished up onto slate platters. Ask the staff to help you tackle the wine list – they’re always excited to share their knowledge of each bottle and will point you in the way of a natural, sulphate-free drop. Flushed rouge from several glasses of red, you’ll need some fresh air. Stumble out of the cave and pace 200 metres up the hill to 72 Rue de Belleville. 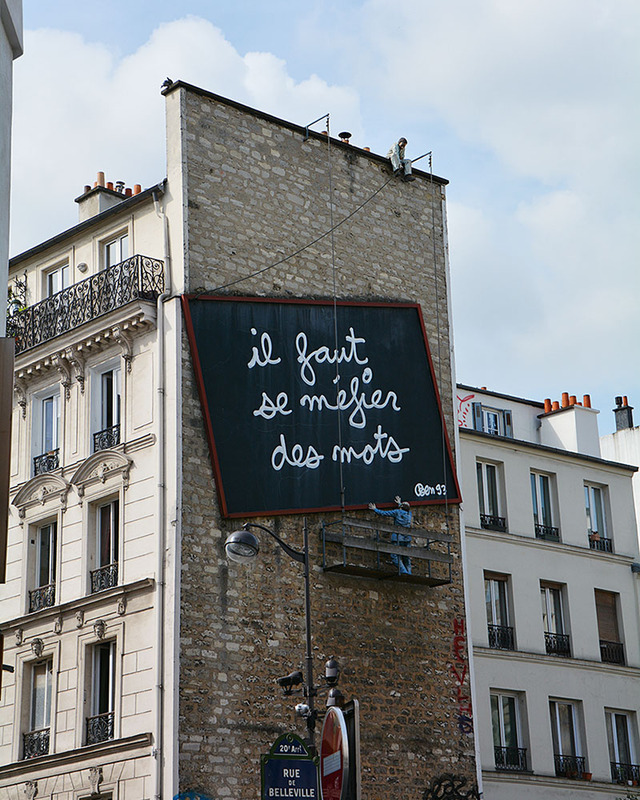 If you believe the engraving above the door, as the curtains closed on 1915 a baby Edith Piaf bellowed her first notes from her birthplace on the street by the entrance. While this part is contested (it’s generally accepted that she was born in a nearby hospital) none could argue with the part that says “Dont la voix, plus tard, devait bouleverser le monde” (whose voice would later turn the world upside down). Walk in the Little Sparrow’s footsteps back down the hill to Aux Folies, a 100-year-old cabaret venue best described as charmingly retro. The pint-sized songstress crooned here in her early days on the stage, and it’s now a bar where bobos (bohemian bourgeois), students and office workers go to discuss politics, read or watch le football – France thumping Germany is a prime event. A flickering neon sign illuminates punters spilling onto the street and into Rue Denoyez, the only alley in Paris where graffiti is legal (not that they take heed elsewhere). Aux Folies is the place to be on a balmy night in Belleville. It’s midnight, and you need to get moving before exhaustion catches you in its grasp. Get a head start by crawling beneath the glowing red lights of the Art Deco Belleville métro sign, buying a €1.90 ticket and boarding a train. It’s just three stops to Oberkampf, with a line swap at République, but you’ll save your legs a two-kilometre walk. This neighbourhood has an air of Berlin about it, with shabby chic bars running down Rue Oberkampf and in the web of surrounding streets. Follow your whims to a few, then join the line snaking into Nouveau Casino, a nightclub adjoining Café Charbon, a Parisian institution. Decked out with an impressive sound system, it showcases underground acts as well as big names. Chandeliers dangle from the geometric, reflective roof and barkeeps pour drinks behind a glowing, candy-coloured counter. The night’s just getting started in Oberkampf. Crêpes – street food at its finest. Emirates flies from Australian cities to Paris via Dubai from AU$1400. The best way to get a real Parisian experience is to rent someone’s apartment while they’re away. There are plenty of excellent little places available in the Belleville area on Airbnb. Vélib’ bicycle tickets are available online and from on-street stations. A one-day ticket costs about AU$2.50, while a seven-day pass is AU$12.